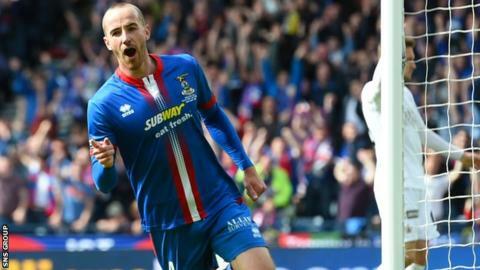 Inverness Caledonian Thistle duo James Vincent and Danny Williams have signed pre-contracts to join Premiership rivals Dundee next season. The midfielders have both agreed three-year deals at Dens Park. Williams, 28, moved to the Highlands in the summer of 2013 from Kendal Town and has made 35 appearances this term. Former Kidderminster player Vincent, 26, also joined in 2013 and scored the winning goal when Caley Thistle won the Scottish Cup last season. Vincent has been troubled by injuries this season and has been limited to 16 outings, the last of which came on 2 January. "It's two boys we've been chasing for a long time," manager Paul Hartley told BBC Scotland. "They've been part of a very successful Inverness team over the last couple of seasons. "Danny is versatile, he can play in a number of positions. It's the same with Vincent, anywhere across the middle." Meanwhile, Paul McGowan and Darren O'Dea have signed new contracts at Dens Park. Midfielder McGowan, 28, has agreed a two-year extension, while former Celtic defender O'Dea, 29, has earned a three-year deal, having joined the club in January. "We've been trying to build a squad over the last two years and this summer there will only be maybe three or four changes," added Hartley.